A manager at his desk, in front of his computer, with a coffee on his side, filling out an employee survey. If used properly, questionnaires, polls or surveys have the ability to give employees a voice within their organization. Managers can obtain information that will benefit their employees and improve their company. They offer the opportunity to give employees a voice about issues management may be ignoring. The problem lies with the way that surveys are administered, causing employees to view them as time-wasters that don’t change much. On the other end of the spectrum, HR managers have the stressful task of getting people to participate and then having to take the time to analyze the data, and come up with a good action plan to make sure employees are satisfied. If there is no proper implementation strategy or plan set in place, it can be quite the hassle to utilize and work with the results. However, working with an employee engagement survey vendor that has a simple strategy and is capable of matching the needs of your company with a survey, makes the job a lot simpler. This infographic was crafted with love by Officevibe, the leader in employee engagement survey software that uses frequent and honest employee feedback. 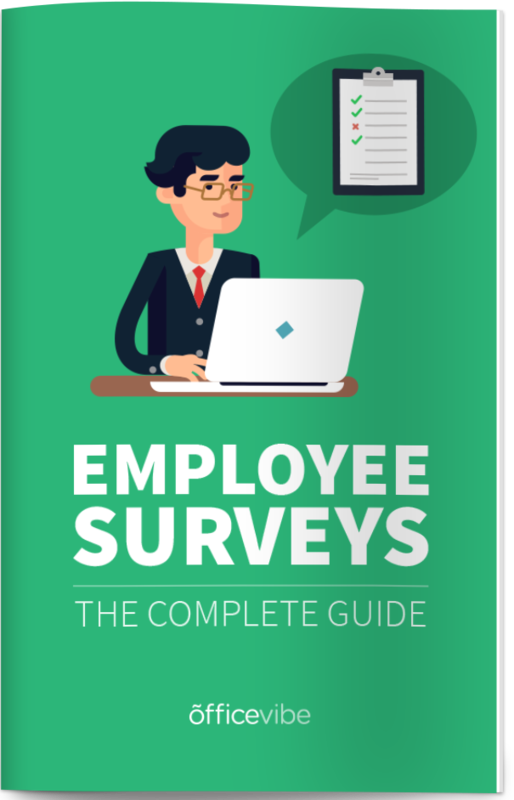 When HR departments first come up with the idea of measuring employee satisfaction through surveys, it’s extremely easy for them to get stumped with the vast amount of vendors and tools that are out there. Some vendors offer different templates or surveys that they have to create from scratch, others even ask hundreds of questions to employees at once. Even the simplest surveys have about a 5-week period for implementation and getting answers. Choosing a vendor, setting up and getting it out to employees takes even longer. Then coming up with an action plan of the results that is transparent and fair for employees will take some time. So, it’s safe to assume that the traditional process is a bit time-consuming and harder to set up. Especially with larger enterprises. Traditionally, annual engagement surveys have been the way to get a lot of collective feedback and metrics from employees. Whether negative or positive, human resource departments rely heavily on either quarterly or annual surveys to collect information. The main problem with the old-school approach is that the quantity and quality of answers don’t accurately reflect an employee’s recent engagement levels. In fact, it only reflects the data of the time that it was conducted. Meaning that if someone had a bad day and took the survey without paying it any mind, they’re giving a (negatively) biased answer. In fact, most vendors will set their engagement surveys in the middle of the summer because data shows that that’s when their employees are the happiest and most likely to participate. So the participation rates will be higher but still won’t be able to accurately measure engagement during different times. As a quarterly survey will at least give a good sample of data to see if anything has changed throughout the time — And management will have the ability to see if the action plan that was implemented from the previous survey’s results worked. Regardless, with these kinds of engagement surveys, administrators are looking to measure if the employee is satisfied — which is terrific, but they may not have enough data to accurately assess how motivated, satisfied, or involved their employees are. Employee pulse surveys have become the new way of measuring employee engagement and job satisfaction. Essentially, these are short employee engagement questionnaires that are done frequently and only take a about a minute to complete. They utilize what experts refer to as “people metrics” in order to give statistics to benchmark things like company culture and employee health. An organization will even be able to track the company’s engagement trends and see what works for their employees and what doesn’t. So if there are any drastic decisions made, having weekly data shows how it affects the organization. Weekly surveys are also a great way to keep ongoing touch points with new hires and to make sure that their onboarding is going well. Not only is it more effective than the run-of-the-mill annual survey, but it takes less time to implement, it collects more data, and it has higher participation rates. And the most important thing of all, it is the most cost-effective way of obtaining valuable HR analytics. If an HR manager can act as a “people’s data analyst” of sorts, there is less of a need for a consultant to dissect the information. In fact, some platforms will even offer survey consulting for their clients, in order to ensure their utilizing their data optimally. When creating a survey, it’s important to understand the different types of questions you can ask and some of the pros and cons associated with each. There are two types of questions you can ask: quantitative or qualitative. The good thing about these types of questions is that they can be grouped together easily, letting you compare results across teams and spot trends. All of these responses can be converted into a numerical score to help you do statistical analysis. Qualitative questions, on the other hand, are open-ended questions that you use to get more detailed information on a particular topic. What’s the #1 thing you would improve at our organization? What are some things that your manager should stop doing? What’s holding you back from recommending our organization as a great place to work? They can be used for many different things, but we’ve found that the best way to use them is to follow up on the quantitative questions. Ideally, you would use both, because that will give you the most amount of data to work with. If it’s all qualitative, employees might get overwhelmed, but if it’s all quantitative, you might not get all of the data you’re looking for. Writing survey questions can be tricky, and there are a few things you’ll want to avoid to make sure the data you get is as accurate as possible. Here are some things to avoid when writing survey questions. Leading questions encourage employees to answer a certain way, skewing your data towards what you already think. Wouldn’t it be great if we had more fruit in the kitchen? You’re leading people to say yes, whereas if you were to ask it in a more neutral way, you might not get the same response. Vague questions will only confuse the reader, either making them give you an untrue answer or getting them to disengage with the survey altogether. What do you think about feedback? Do you mean in general? Here? Are you asking if I want more of it? Be as specific with your question as possible. This is where you combine two questions into one, which again, can confuse participants. My manager gives me good feedback and gives me enough autonomy. What if they give you good feedback but no autonomy? You won’t be able to answer “Yes” in that case. Make sure your questions are as clear as possible. With all of these things to keep in mind, it can become overwhelming to know which questions are good to ask. Our research has found that there are 10 metrics of employee engagement that you’ll want to be measuring. Here are the 10 metrics, along with a few questions for each that you can include in your next survey. 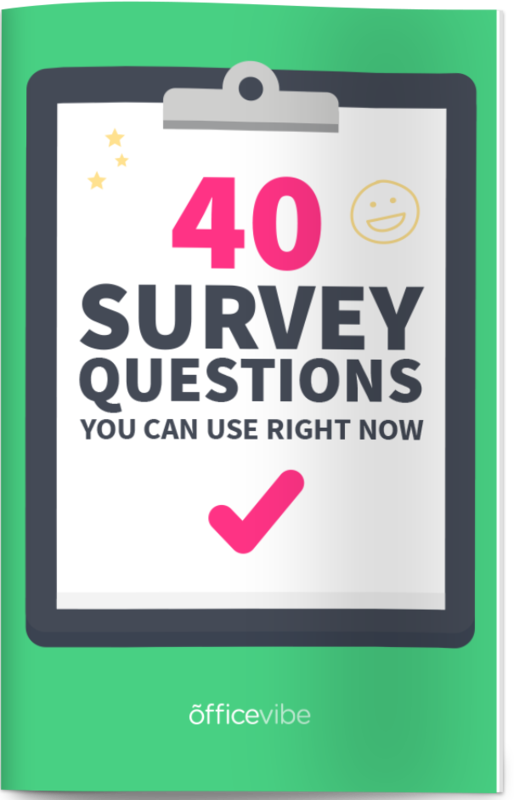 Free Bonus: Download the complete list of 40 must-have survey questions. On a scale from 0-10, how close are you with your manager? How often does your manager check in with you? On a scale from 0-10, how happy are you at work this week? Do you leave work at the end of the day feeling happy? How do you usually feel when you get to work? How would you qualify your eating habits? Do you think the company’s values align well with your personal values? Do you believe in the mission of the organization? Is your work environment too noisy? Are you happy with your current salary and benefits package? Do you have at least one close friend at work? How often do you eat lunch with your colleagues? How often do you get feedback on your work? Does the feedback you receive help you improve? When was the last time your manager gave you recognition for your work? The last time you were praised, were they specific for what they were praising you for? On a scale from 0-10, how likely are you to recommend this organization as a good place to work? Are you proud of where you work? With all of the time, effort, and money that goes into creating and promoting an employee survey, your goal is to have to highest participation possible. Building trust inside your organization is the most important part. You need to have a culture where employees aren’t scared to speak their minds. This takes time, and takes effort from everyone, but it’s worth it. Your employees will be much more likely to participate in any initiative (including surveys) that you put forth. Explain everything: why they’re taking the survey, how many questions it contains, how long it should take, etc. Take the survey yourself to see how long it really is. You should be aiming for 3-4 minutes ideally. Just remember, only ask what’s absolutely necessary. Otherwise, remove it. One of the most important parts of the employee survey is communicating the results to everyone. Employees are already skeptical (naturally) about your motives behind the survey and if anything will ever be done with it, so it’s your responsibility to address that concern. According to our latest report on employee engagement, 52% of managers said that they don’t always act on feedback they’ve received. Once you get survey results back, what you’ll want is for each manager to meet with their team to discuss the results and talk about next steps. The more you include employees in that process, the more engaged your team will be and the easier your job will be. Here are the steps you should take once your survey results come in. Once the survey is over, you should thank employees for taking the time to participate. Keep in mind that they did this for you, to help you figure out how to improve your organization and retain employees and hire amazing talent. Don’t take that lightly, they could have ignored the survey altogether, so remember to thank them. Thanking them for participating in the survey is one part of your overall employee recognition strategy. Praise is an essential part of engagement and you should be mindful of everything your team does. You can do it by email or in-person, but whatever format you choose, you should be sharing the results and explaining them. Explain to employees if they’re good or bad, what you were expecting to see, or if you’ve improve from the previous survey. Explain that the next step will be to meet team by team and go though the results together. Remember, there’s no such thing as too much communication, so make sure you’re telling employees everything at every step of the process. Once the results have been explained, you and your team should take some time to come up with a few ideas for where you can improve. Again, you’ll want to involve your employees in this process as much as possible. Pick one or two items from your results as things you could work on improving, and then together, come up with goals to start working on those items. Follow up regularly on the goals you set to make sure that the entire team is aligned and on the same page. Another thing you can do is communicate the one or two goals that your team picked and share it with the entire organization. This shows amazing transparency and also lets other teams hold you accountable for your goals. Whether you decide to go “old-school” or “new-school” you should know that one of the biggest mistakes made with surveys at work is that there is no follow-up or no action planning process. Many times when there is an action plan, it takes way too long, so employees have lost interest already in the subject that was mentioned within the surveys. So companies are interested in engaging employees. However, they’re not following through with coming up with a good engagement strategy for their organization. Employees are already skeptical enough about the whole process, so it’s management’s responsibility to earn their trust. It’s best to keep employees in the loop of any future plans that are with the results of their surveys. Employees will appreciate the transparency and make them more likely to participate in future surveys. In a perfect world, they wouldn’t need to be anonymous, but there is currently a lot of fear in most companies around what might be done with what employees say on surveys. Ideally, your culture would allow for freedom of expression without getting into trouble. Unfortunately, that’s not the way most company cultures are. Employees are (rightfully so) skeptical and a little distrusting of what would happen if they were caught writing something negative on a survey. I would say that concerns around anonymity are the biggest reasons for a low response rate, or inaccurate data. The best approach is to ensure that employee engagement surveys are completely anonymous so that employees feel comfortable bringing up issues that are affecting their work. Would an employee really feel comfortable reporting a leader who takes advantage of power by talking to an HR person? Probably not. But if you give the person a medium to voice their thoughts, they’ll be completely honest. While this might seem annoying to the management team, it’s important to shift your focus away from who said it to what is being said. The key is to focus on the content of the message and address the problem. The only concern is a potential problem with following up to get more details, but there are a few ways around this. For example, in Officevibe’s software, we give managers the ability to reply to feedback while maintaining that employee’s anonymity. What this ends up doing is ensuring the employee’s trust, while allowing for a conversation to occur.